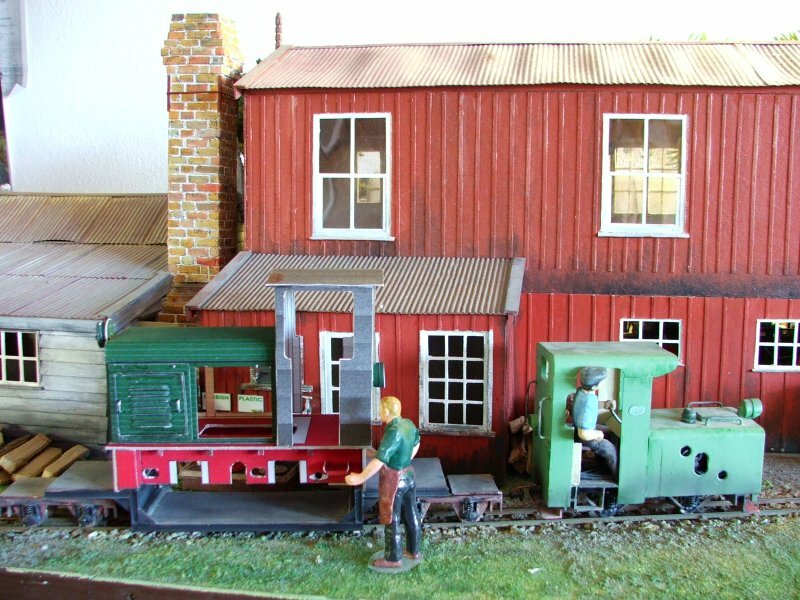 Minimum gauge modelling in other scales. 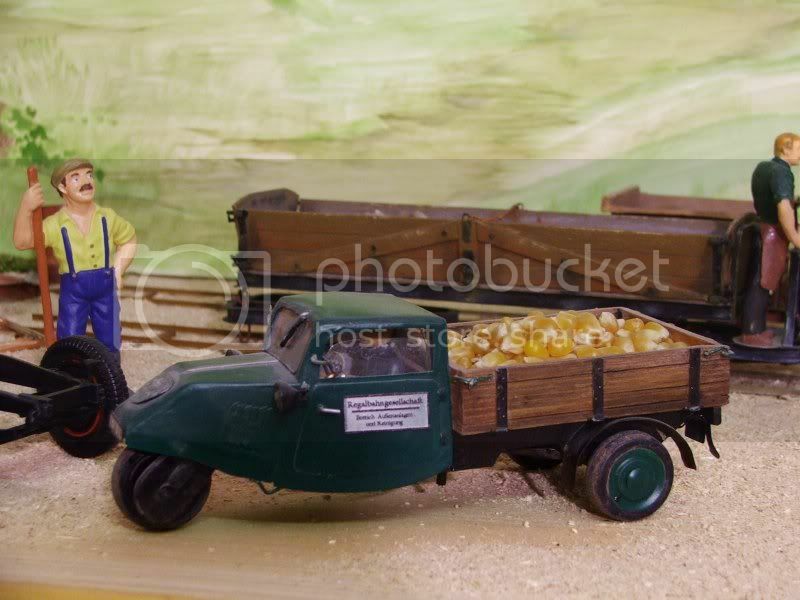 I want to show you my small skips from cardboard . The middle skip you knows it already, the right is new , built according to the same principle. The left dumper is my own construction at the computer, similarly the welded cars, as it was built in East Germany. ... and it could become a nice train . Last edited by Christoph on Fri Mar 09, 2007 7:04 pm, edited 2 times in total. The loco is a Max Orenstein loco No 60 , build 1894 . It is from a polish card kit , changed from 1:25 to 1:22,5 .
and my illness calls "Feldbahn". I did something lead into the middle carrier, so that it gets more weights. The tippers roll rather well. More test I can make if I built enough track. a new one is finished , a braked skip . I drew it the first time with Corel and now with Inkscape under UBUNTU (Linux). Probably I will try to draw a Gn15 version . In addition some tests are necessary and it will last some time. Of course I will communicate it here . My first frames I glued on top of each other but that was not so simple. Now the upper and lower frame parts are bent at the straight sides and stuck one on the other. After that a strip of cardboard is glued from the outside into the developed profile. Like that it is three-way strengthened and sees evenly smoothly from the outside. PS. 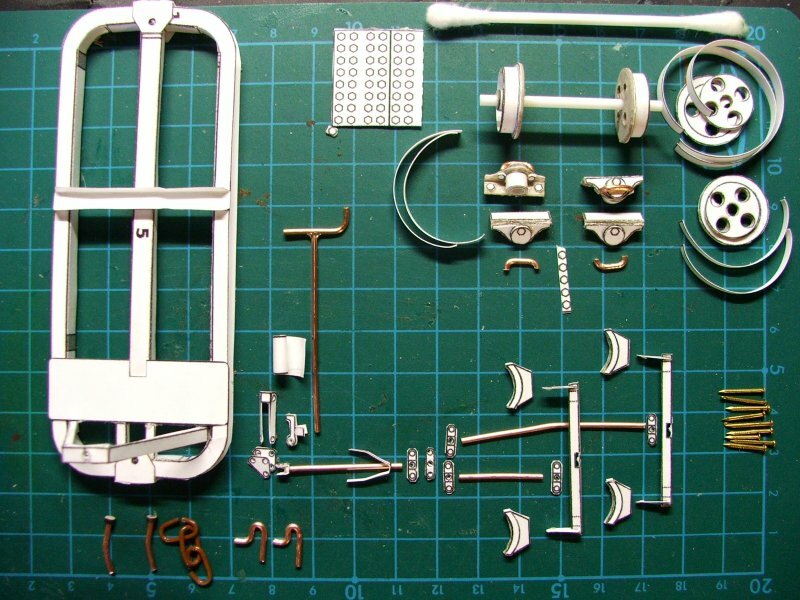 It would have to be possible to build these frameworks from thin styrene, however the parts must be glued then directly one on the other. Andy died 14-Sep-2017 and will post no more. Travel well on your new guage. Chritoph, ich wünsche, daß mein Deutsch so gut wie Ihr Englisch waren. The straight parts of the top and bottom of the frames have tabs (A), which glue together (B), and then a strip of card is glued to these (C), with the curves formed by eye. The any gaps are filled with glue before you paint the frame. Neat. I'll have a try this evening. now I would like to show you what I did in the last two weeks. The breaked skip is very rusty in this time. Then I work on a Ns2f for this train . In the meantime are uses 3 pieces A4 cardboard. Since today it has own feet. For this reason I love this material so much. It is always possible to represent the correct thickness. Therefore I paint my models with several layers synthetic lacquer. Latex or acryl are not possible because it would destroy the cardboard. After long drying time can be used every other color for weathering. 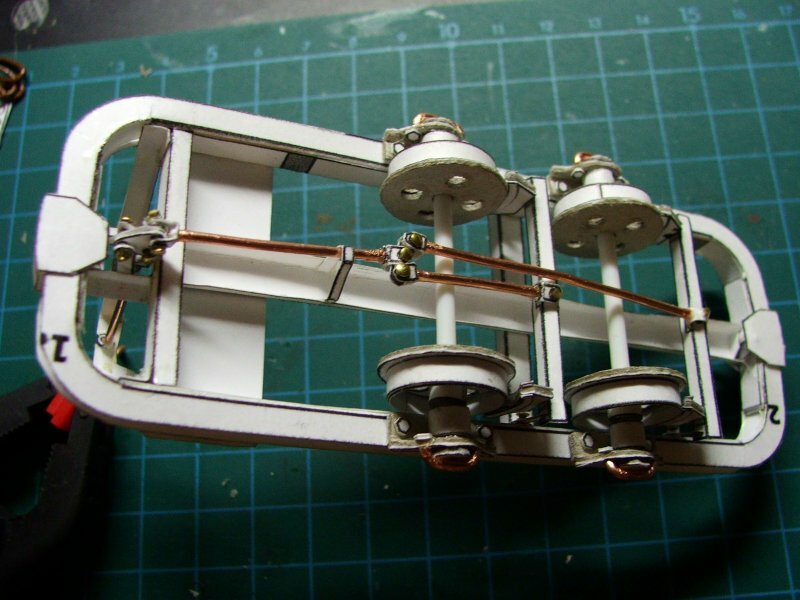 I glue my models with UHU-Hart: "Airplane Glue"
I built a chassis from cardboard with functional brake. If I had a threaded rod it were absolutely originals . Thus I must pull out the crank somewhat upward to brake . 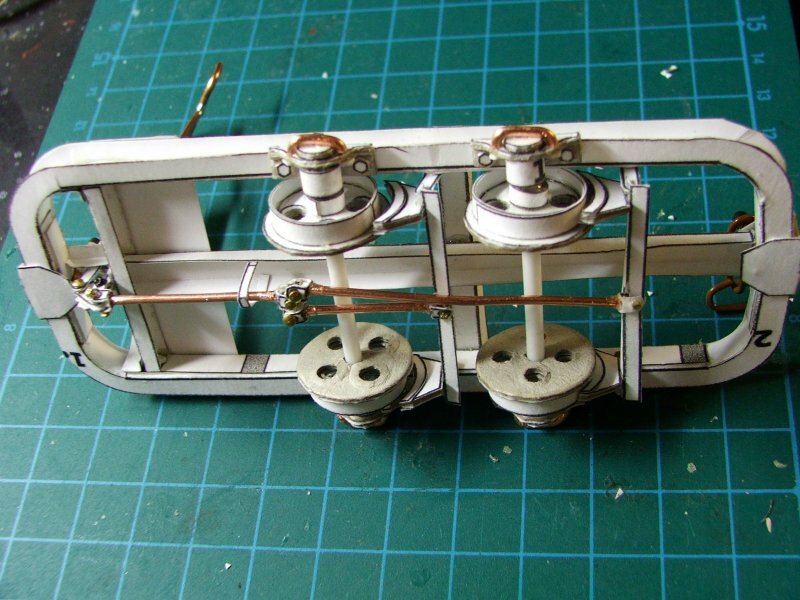 In the frame of the loco I built a drive using a Chinese geared Micromotor. I built the cranks from brass and strengthen the bars with copper sheet. A simple remote control from a toy was used. Also I could hide 4 AAA Akkus therein. And now I have still a small video for you. The card train drives on my balcony. my Loco is nearly finished . and now I build a larger open car for it. 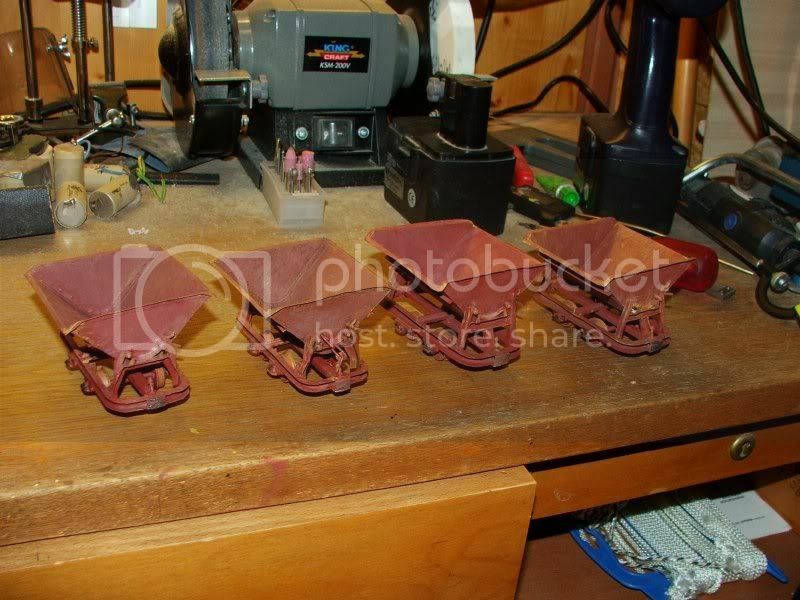 The chassis is from card , only the wheels and bogies are from brass . 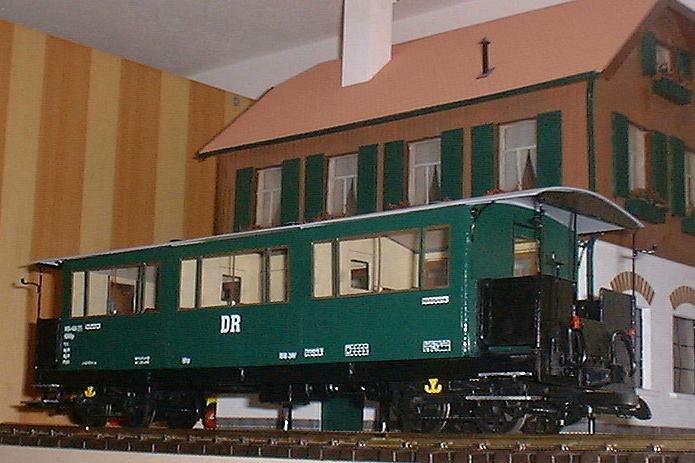 It is a car from the MPSB (Mecklenburg- Pommersche Schmalspurbahn) 600 mm gauge . This railway company was created 1892 in the north east Germany . Products of the agriculture were transported , but also persons . At the best time of the railway company there were more than 200 km tracks. This car was built between 1910 and 1930. 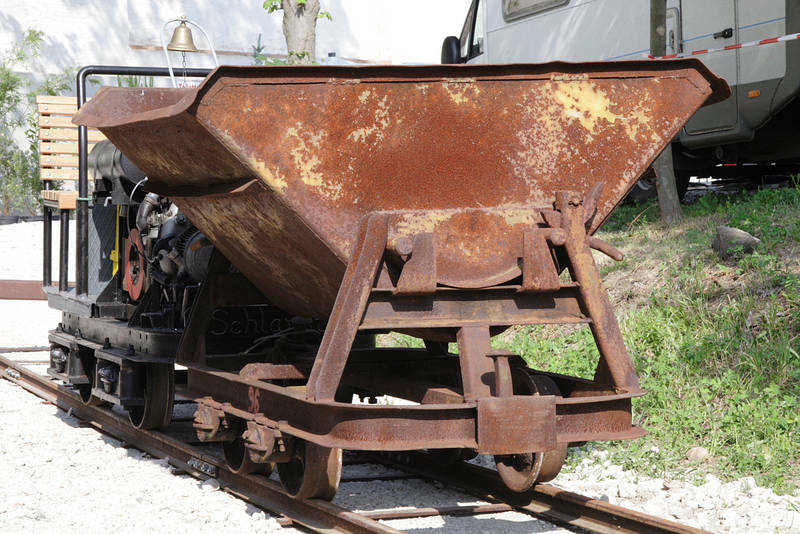 After the end of the narrow-gauge railway , end of the sixties , unfortunately nearly all vehicles were scrapped. From this cars only pictures exist. Wonderful Christoph, I have to keep reminding myself that these are made of card, they are so good. 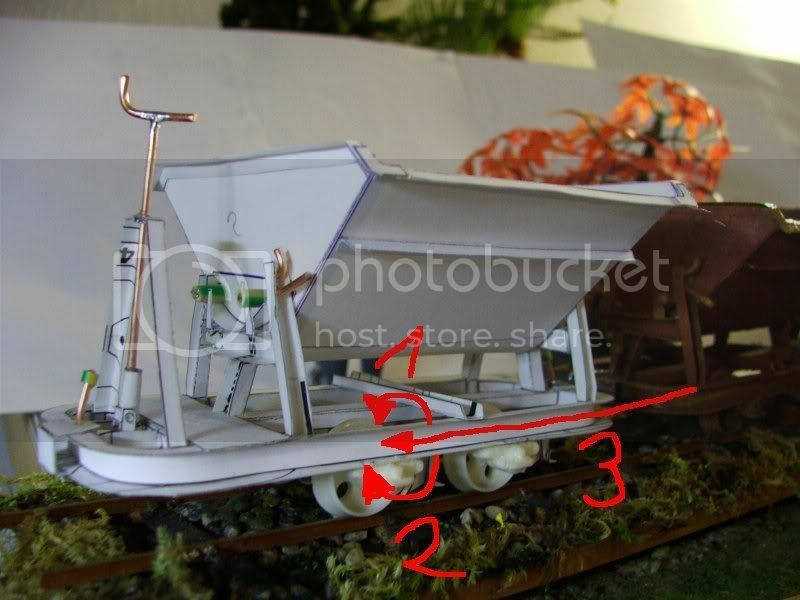 I really like that bogie wagon, beautiful work. Very clever way of doing the rivets, do you put the "Window Colour" directly onto the card . I'm using the black bottle for contour. Before I dab the color up, I mark with a pin the rivets. Last edited by Christoph on Tue Feb 06, 2007 4:40 pm, edited 1 time in total. I cut disks from brass round bar. On the disks I drew the correct form. The remainder with saw and file. I clamp the finished cranks one above the other into the vice and bored the holes with all the same distance. Otherwise the connecting rods clamp . The distance of the drillings in the rods has to be accurately the axle base. For an easy play, I increased the holes horizontal something . I built a potato car for my Feldbahn from cardboard . 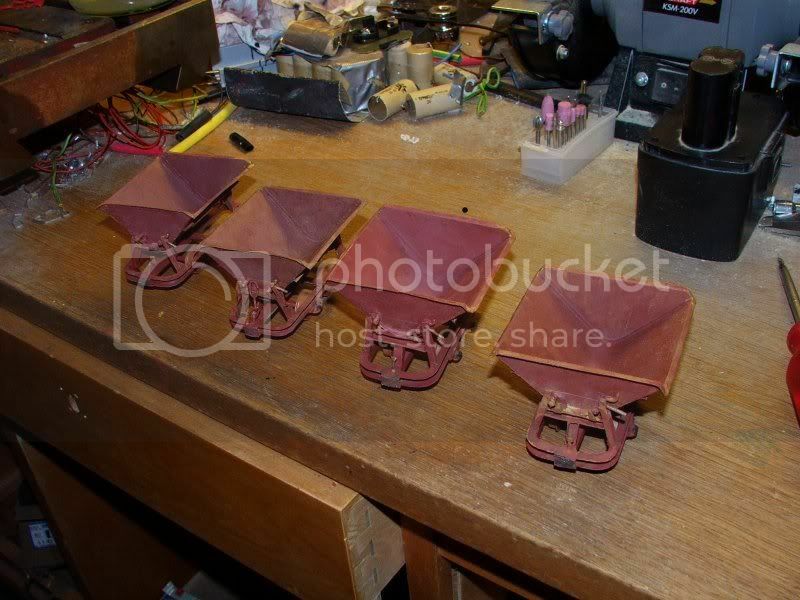 It consists of the frameworks of my skips and a Polish cardboard kit . Some small parts are missing still but today was beautiful weather to make photos . Here is the complete threat from the greman Buntbahn Forum with some original pictures of such cars. here is the reason, why I do not have time for Gn15 for the moment. Agricultural products are shipped and clay for a brickyard must be transported. Some things rust in a corner. 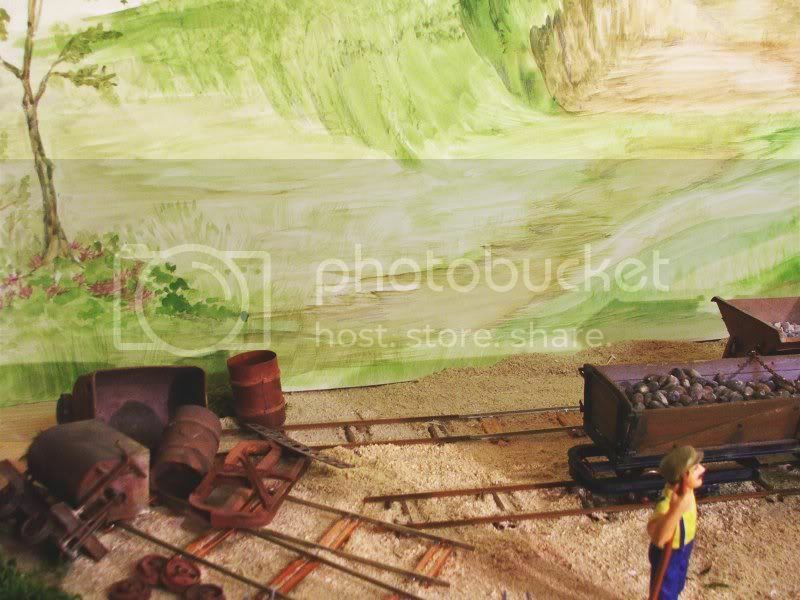 That is a small part of the layout, which I build with a friend, for an exhibition at the end of June in Schkeuditz not far from Leipzig. That is set up all loosely on a board to test it . I would not like to build a firm layout but put the tracks loosely on the baseboards and strew on it sand, crushed stone and saw flour. Thus I have more flexibility and it can be transported more simply. It does not have an engine. It may not even run. Perhaps I must cultivate oats for it. 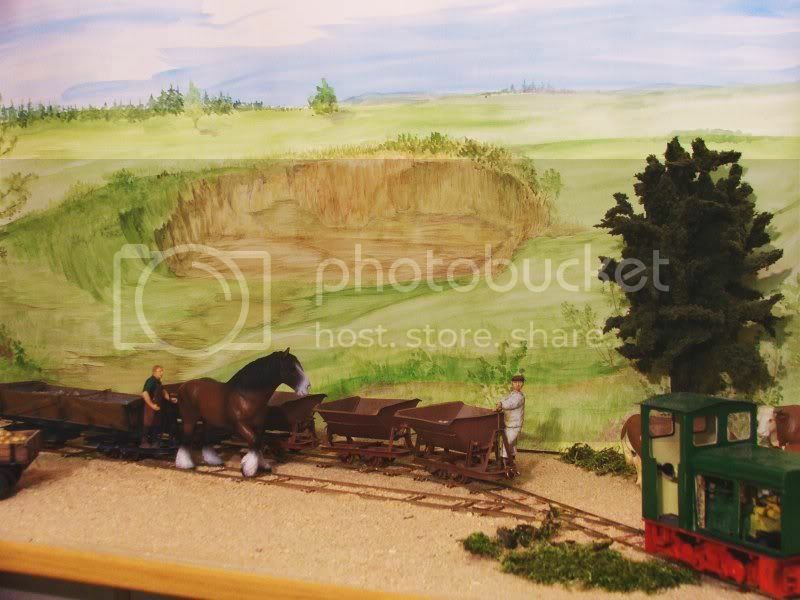 But there are model railways with oats engines in Spain. Still another word to the tracks. I did the tracks after an old catalog of O&K. A friend manufactured me a device for pressing the sleepers. If there are new pictures, I will show it naturally ! I have completed my little Orenstein card steam loco. as the sun was looking for a moment. 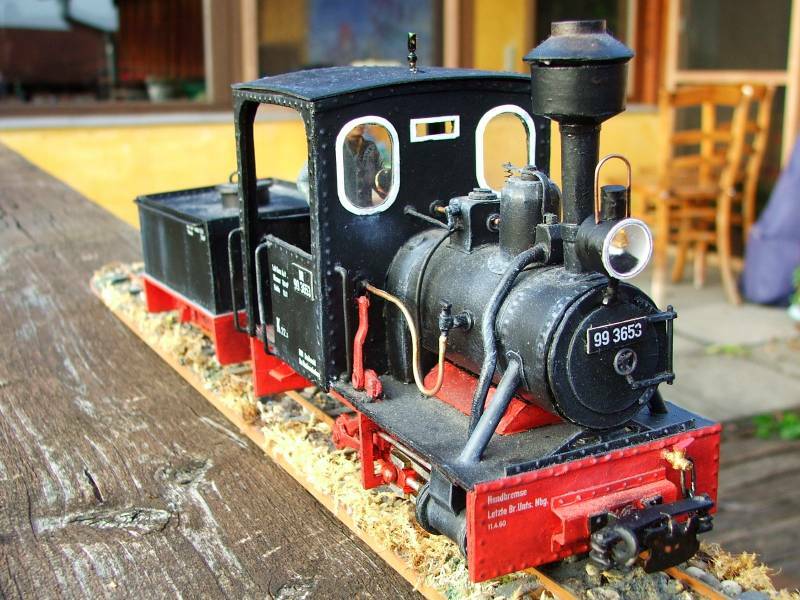 We were invited to the Rail Expo Paris with our Feldbahn . And now there is still a lot to do. Interests: narrow gauge everything...and standard gauge too!!! 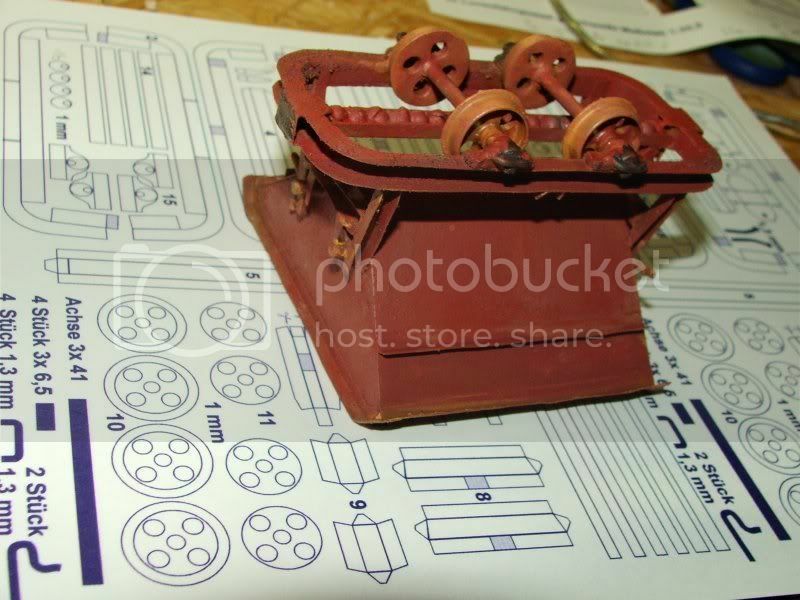 Where can I find the plans for the skips and the Orenstein card Loco ? Sleeper Cell new album out soon!